With headlines like these, how could you not be worried about an oversupply? Is the Downtown Apartment Bubble Bursting? As an institutional multifamily broker, I think there is more to the story. Chicago’s units under construction represent just more than 4 percent of existing inventory. Comparison cities, such as Seattle (10.5 percent), Miami (7.5 percent), Washington D.C. (7.9 percent), Denver (11 percent) and Boston (9 percent), are all undertaking a much higher delivery burden, and risk, relative to the historical size of their markets. Chicago’s wave of deliveries is front-loaded toward 2017 and 2018, totaling just less than 20,000 units within the entirety of official city limits (both downtown and neighborhoods). Many of these projects are already under construction, giving the city a good estimate of the inventory size going forward. In contrast, many of the comparison metros are loaded with 2019 and 2020 projects: West Coast cities are finally seeking to expand their inventory after decades of restrictive policies against developers, and Southern cities are sprawling under population growth. These cities are banking on large numbers of deliveries even further into the ebb of the current cycle. Development excitement in these metros is still high, and later deliveries could face a much less amenable environment than the past few years. With new affordable housing restrictions in place in some of Chicago’s hottest submarkets, the city’s pipeline for this cycle has a well-defined horizon — any glut of deliveries will have time to absorb and stabilize after this point. While Chicago has seen the cliff’s edge and has ample time to engage the breaks, other cities continue to hurdle forward, seemingly unaware of the size of their own markets. 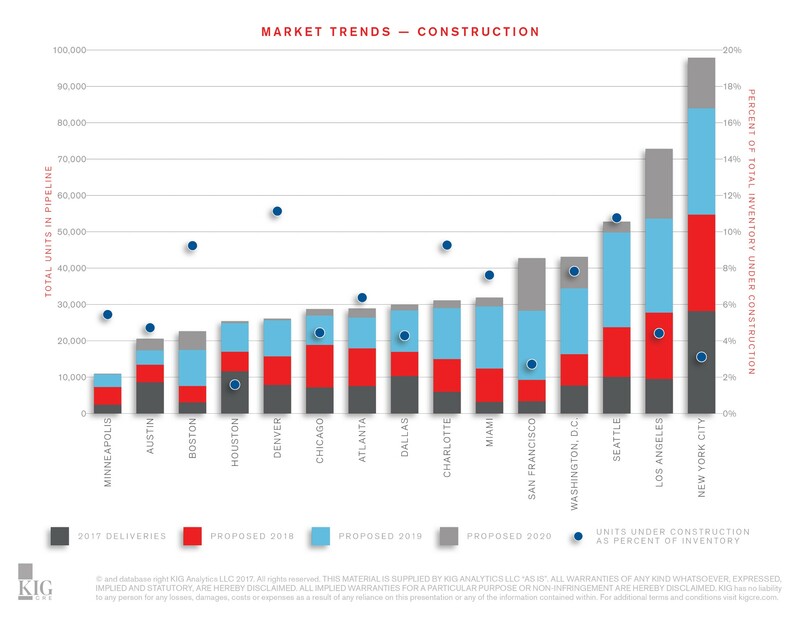 The graphic below illustrates 2017 deliveries and proposed 2018, 2019 and 2020 deliveries by major metros experiencing a development boom.